Below is a list of the sections of the survey. You can select the whole survey by ticking that box, or you can tick the boxes of the sections that are most important, or relevant to your life. Once you have ticked the sections you want to complete, scroll down the page and they will appear. Each section will take about 5-10 minutes to complete, depending on how much you tell us. If you choose to complete the whole survey, but don’t want to answer a question, just skip it. You can still submit the survey if you leave questions blank. Each question includes options to answer yes, no or unsure. There is also a text box and we encourage you to tell us more about your experiences. These questions are about your right to participate in the community. Do you have access to all the support services you need, for example, disability support, aged care support, childcare, home-help? Do you have access to all the mobility aids, devices and other support you need? Can you afford the mobility aids, devices and other support you need? Do you know where to find information on Government services like the disability pension and the NDIS? Is the information accessible and easy to understand? Is the information available in your community language? Do you have the opportunity to give feedback to government about issues that are important to you? The questions relate to the right to health. Do you have access to the health care that you need? Do you have access to health information you need? Do you have access to the treatment you need? Are you able to choose the treatment that you have? Do you have any problems accessing health insurance because of your disability? Do health care people understand your needs? Do health care people know how to communicate well with you? These questions are about your right to education. Do you have the same education opportunities as other people? Does your school, university or training college make changes for your disability, for example do you get course material in an accessible format, or do you get access to an interpreter? Are you separated in your school/university or training college from students without disability? These questions are about your right to employment. Do you have the same work and employment opportunities as other people? Does your employer make adjustments for your disability, for example do you get flexible working hours or interpreters for staff meetings? Do you receive the same pay for your work as someone without disability would? These questions ask about your right to life and safety in the community. Do you feel safe in your community? Do you experience violence or abuse because of your disability? If you have experienced violence or abuse, could you access appropriate support and services? These questions ask about your right to family and parenting. Do you get appropriate support to have relationships, including sexual relationships? Do you have difficulty accessing Assisted Reproductive Technology to help you a baby, such as IVF? Can you access support services to assist you to be a parent? Have you had a child removed from your family because of disability? Have had medical treatment which stops you getting pregnant? Is your income, from wages or your social security payment enough to support your needs such as rent, food and transport? Do you have difficulty dealing with Government agencies, for example Centrelink, housing agencies? These questions relate to your right to equality. Do you feel that you are discriminated against or treated unfairly because of your disability? Do you feel that you are discriminated or treated unfairly because of your race or your gender? Do you feel you are discriminated against or treated unfairly because your body parts are different from ideas about how boys and girls should look? This is sometimes called intersex. Have you experienced medical treatment because of this? Do you know about discrimination laws? Do you feel that the discrimination laws help you when you have been treated badly? Do you think the general public have a good understanding of disability? These questions relate to accessing the legal system and equality relating to the law. Do you feel that police, lawyers and court staff are trained properly to support people with disability? Do you feel you have the same access to police, lawyers and court as people without disability? Do you think people with disability have the same opportunity to participate in the justice system, such as on a jury, as people without disability? Do you control your money and property the same as people without disability? Do you have difficulty moving between states and countries because of your disability? Can you access public and private buildings, for example, libraries, cafes, workplace and your friend’s homes? These questions are about your right to culture and leisure. Do you have access to social activities, for example plays, television, movies in the same way as people without disability? Can you go on the holidays you want? Can you participate in sports that you want to? Can you participate in cultural and religious events important to you and your family? Do you have the same access to websites, phone and technology, people without disability? 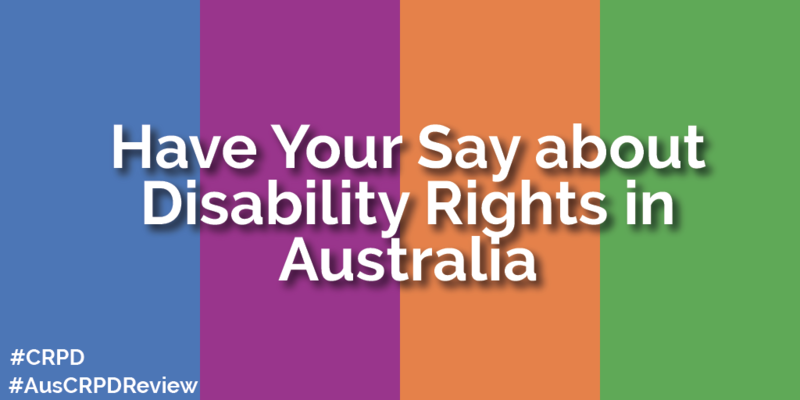 Have you ever spoken to your local politician about disability-related issues? Did they listen to you and do something about your concerns? Are you able to vote in elections, including accessing polling stations and ballot papers? Is online information about Government policies and programs available in plain English and accessible formats? These questions are about your right to protection and preparation for natural disasters. Do you have access to information about how to prepare for a natural disaster, such as a bushfire or flood? Do you think disaster response plans include the needs of people with disability? Have you had the opportunity to provide input to any disaster preparation or response plans in your community? Anything else you would like to tell us about how disability affects your life? Are you of refugee or migrant background? We will not give your email address to anyone. We will not link your email to your answers in our survey.